I’m in San Jose for the GestaltIT Wireless Tech Field Day and I’ll be live blogging the event in this post, so check regularly to get updates. There will also be live stream where you can watch the presentations with us and listen in on the discussions. I’m hoping to a bit more content rich on this event, since I have nearly constant access to power, bandwidth & laptop so should be able to get more photos, documents and other material into the live post. This is the live stream from the video at the event, you can see the presenters and listen to the live audio from the event. 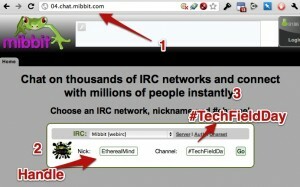 We are hosting a Mibbit IRC channel for people http://chat.mibbit.com so you can connect using a web browser or your favourite IRC client. You can following the #TechFieldDay hash tag for a collection of tweets from all the attendees. You are welcome to the #TechFieldDay tag to your own tweets and we will see them and respond to them. We have the late announcement that Cisco will be also be presenting on their Clean Air products, and in fact are up thing. and checkout what is inside the lunchbox. This is a diagnostic tool for analysing the wireless spectrum. It’s a very small, very focussed company (I’ve not heard of them before) and delivering on spectrum analysis. Some very interesting blog posts on how their software platform works. Really interesting. 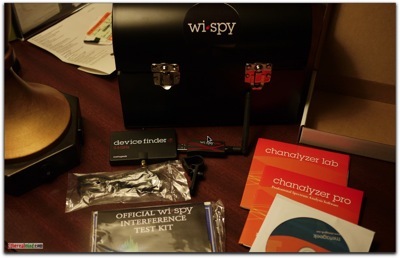 http://www.metageek.net/blog/ . I’m getting a solid impression of these people. They really know their stuff and are very focussed on their business. Good point that Cisco Clean Air spectrum analysis doesn’t fix the problem, it works around the issue. You still need tools like MetaGeek to trackdown the source of the interference and take action to fix that. 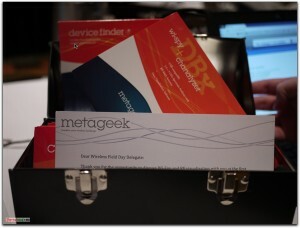 Metageek provided delegates with a metal lunch box, and samples of their current products. 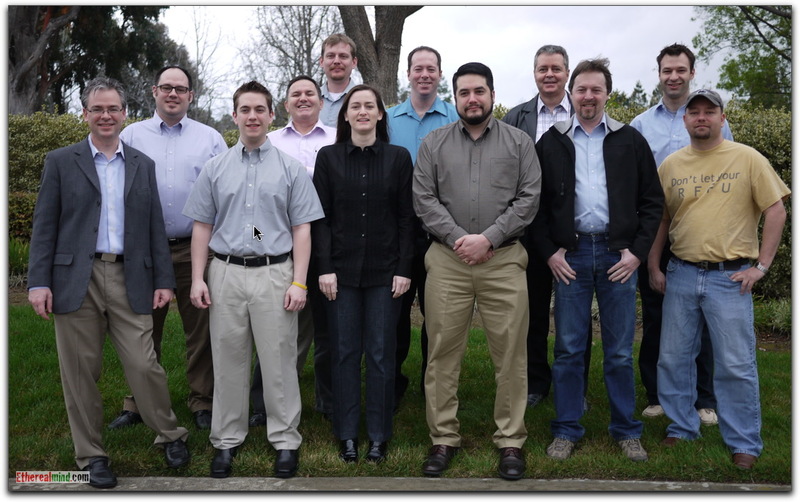 Cognio was the acquisition of the spectrum analyzer that was folded into the Clean AIr product. Wireless is serious about physical layer problems – and this not normally an issue in wired ethernet so it’s a new technology. Cisco Bandselect – allows directing wireless clients that support 5Ghz and 2.4Ghz to use the 5Ghz band for better overall performance. wireless moving from best effort wireless to guaranteed SLA. When wireless doesn’t work, it’s not obvious what the cause is. Unless you’ve got a spectrum analyser. RRM – Wikipedia – Radio resource management – Clean Air is an implementation of a technology of doing this. RRM involves strategies and algorithms for controlling parameters such as transmit power, channel allocation, data rates, handover criteria, modulation scheme, error coding scheme, etc. The objective is to utilize the limited radio spectrum resources and radio network infrastructure as efficiently as possible. Off channel rogues – AP that have custom firmware that sits off the defined frequencies to try and find new RF space. Widely available for open source APs and some forms of AP management platforms may not be able to detect these. Basically Proactive Spectrum Management – using clean air. Difference between WiFi & Cellular. Currently we use WiFI over Direct Antenna System * Shared co-axial is the traditional solution. * Cisco has a product that uses the existing ethernet cable to act as a HF bearer for the cellular signal. * While this is interesting I don’t think it has relevance outside of the US markets. It’s unusual, but solving a problem that only applies in places where signal strength is poor, and that requires low population density and /or poor signal types. So not many marketplaces will need this type of solution. WiFI as a complement to 2G/3G/4G. As always, Cisco has a lot of information on their products, and you can feel confident that they will tell you what is happening. We had a interesting off camera discussion that basically comes down to the fact that headline speeds to do not equate to high performance. This refers to the fact to multichannel radio bonding consumes RF spectrum and thus reduces that amount of shared bandwidth available to to the total pool of users. Not surprisingly, Cisco has answers for these problems but realise that selling this to customers is going to be very difficult. At Aerohive. Aerohive has a different approach to handling large scale APs using distributed / co=operative model instead of using a control plane model. They call this “distributed intelligence”. The value prop in this idea is that the massive amounts of bandwidth that will be needed to support large numbers of the WiFI enabled devices. On this basis the use of controller based network designs isn’t going to be the answer, in a sense it’s yesterday solution to yesterdays problem. Aerohive is using a distributed control plane concept to deliver an contrarian view of how you make AP networks. using a SPF type protocol to distribute configuration and status information throughout the Hive. 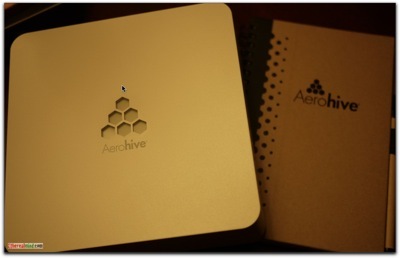 Aerohive provided delegates with a sample product, nice notebook and shirt. 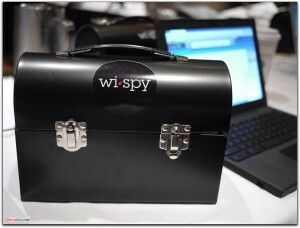 Wireless Field Day – Day One Wrap-up from Stephen Foskett on Vimeo. Feeling a bit bleary today but we have enough coffee to push on through. We have returned to the HP Enterprise Briefing Centre in San Jose. It’s a fancy building and filled with lots of HP’s collest toys including their rather glamourous retail products. I wonder if the combined controller / thick edge idea is driven by a desire to not alienate the customer. If you have a HP wireless, you would like to have a transition plan to move to where you are using thin clients, to implementing thick clients. So possibly a marketing led transition. the AP are quite ugly. Given that APs are installed onto ceiling, often in public view, why can’t they be visually appealing. HP has designers doing retail stuff, why not spend some time to make a nice case. Interesting discussion what the future of wireless will be. Andrew Von nagy points out that we need better management of end nodes such as multipoint client access. e.g A user might have three devices such as a laptop, tablet & smartphone. When connecting on each device, you want to apply a different policy. e.g. An tablet can have access to webmail and Internet, but a smartphone can have Internet only, but the user laptop gets full access to the corporate network. We are running down the product suite, an. getting some demonstrations of the product and walking us through the main features. Since I’m not familiar with WiFI sniffers this is all new to me, so I’ll be talking about things that interest me. Been installing the AirMagnet SpectrumXT software to get to grips with it. Moved the IPS signatures into a separate module that cab updated without updating the AP OS. I’m not sure I understand the purpose of this, I’m guessing that the Air Magnet WIPS must run separately from the someone elses APs, because they aren’t going to be able to plugin to the existing WiFi network. AirMagnet have provided a sample of their product SpectrumXT (?). I’ll add a photo here later. Fluke are presenting on their AirCheck hand held tester, part of their Portable Network Tools portfolio. Instead of lecturing they are engaging by telling the story of how the product was developed. consider a medium sized business that has three /four people doing everything. attempting to define the word “coverage” for wireless networking is quite hard. I spent some time using the unit and I’m really impressed with it. They have redacted the experience down to a usable.